Provides opportunity for service voids to be created. Can allow improvements to be carried out room by room. Not impeded by the weather so better suited for compressed programming. Leads to quick response to heating. Will leave new internal wall finishes. Good for rooms that are intermittently heated as provides rapid heat response. Involves the extension or replacement of window cills and skirting. 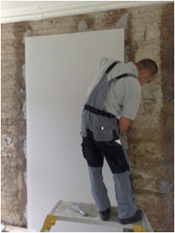 Will include temporary removal, extension and reinstatement of radiators, sockets and switches. Will affect the operation of the building as rooms/areas are closed off. May require the removal of cornice and other ornamental details. Provides opportunity to improve look of a building. The external finish can better protect the building from the elements. Little inconvenience internally as work is carried out from outside (only noise). Good at eradicating thermal bridging. Creates situation with high thermal mass that is ideal for building in continuous occupation. Less trades to coordinate and sequence leading to quicker programme – weather permitting. External insulation may provide additional structural protection to the building increasing its life and value. More costly than internal measures as insulation has to be protected by render or rain screen. Scaffolding can affect traffic and pedestrian routes. Incurs cost of rainwater and roof edge alterations. Scaffolding may present privacy issues.